Sigh, you gotta love living in Ontario. Wasn’t it last week that we were in the middle of a January thaw and Ella was outside without hat or scarf? 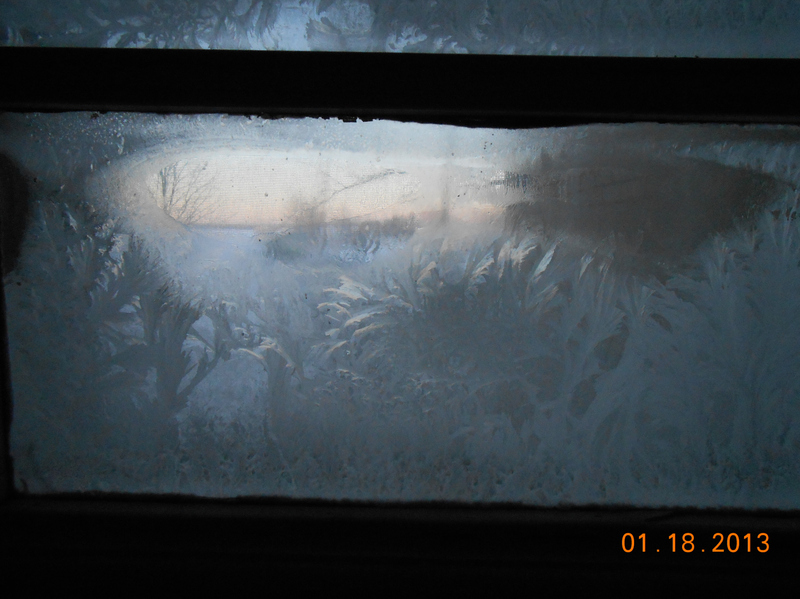 Today we woke up to -25C and frozen door windows. This time of year really reminds us that we need to put new doors on the ‘to do’ list. Our doors are original to the house (1905) and are single pane glass. Needless to say we never wonder where the drafts are coming from. The ice (on the inside of the glass) does make a pretty picture “like leaves” as Ella said this morning. 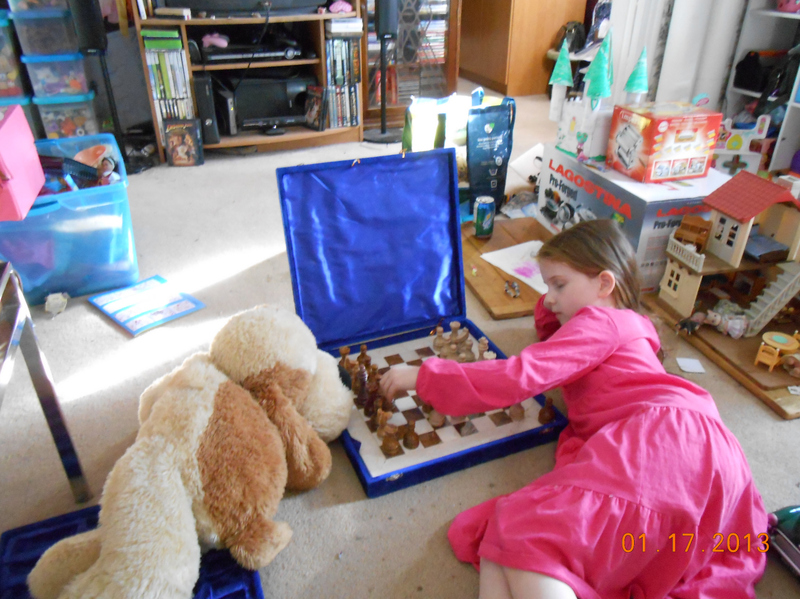 A lovely friend gave Ella this beautiful chess set just before Christmas. It has no markings on it or anything but it seems to be made of marble. Ella loves playing chess, though I need to brush up on the rules to make sure we are doing it right. Here she’s playing with Lula -and Lula almost won! I’m fairly certain I’ve vented here before about my frustration with Starz in Motion up in Petawawa and how they weren’t teaching Ella actual highland dances. Ella was up there for 2 years and didn’t know ONE dance, all they learned was ‘choreography’ for the recital. Luckily I found Pamela Reid in Renfrew and we love it there. 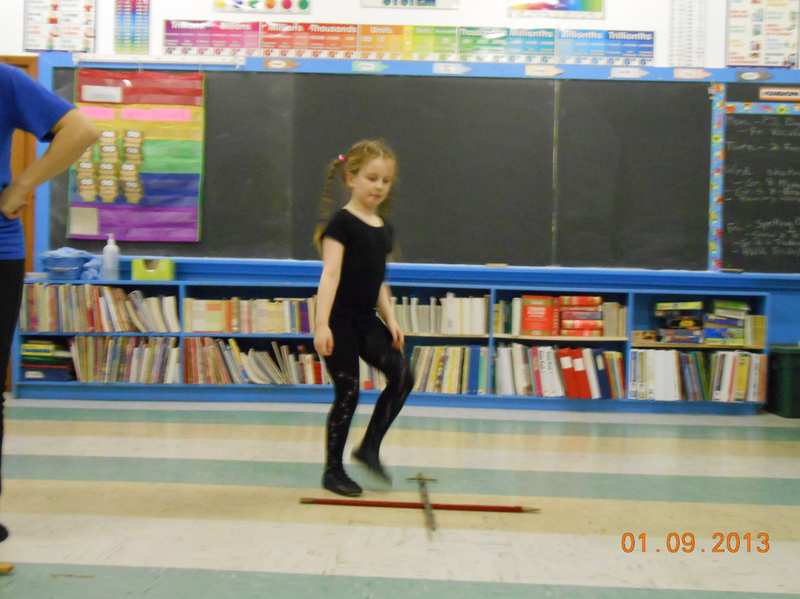 Ella already knows TWO highland dances and as you can see they are starting on the sword dance (which will be 1000 years old in 2026 -cool). In fact, they are dancing at the Robbie Burns supper in Eganville tomorrow. 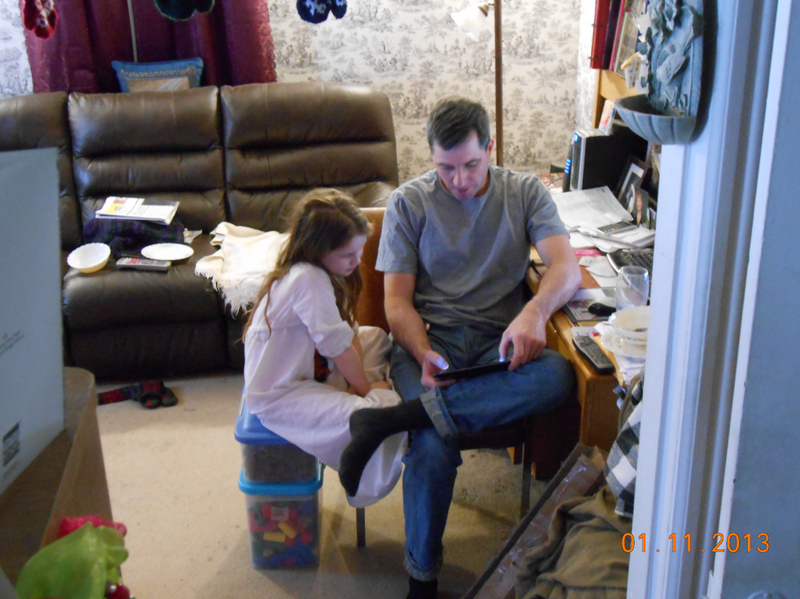 Daddy and Ella playing ‘Angry Birds’ on Ella’s new tablet. Colin really doesn’t ‘get’ just how happy pictures like this make me. He has some idea what things were like with my dad growing up. But unless you were there and lived through it, it’s really hard to truly understand. The Farm Girl is still trying to come up with ways to use eggs, so I came up with this recipe. Boy was it yummy! Melt butter in a frying pan and fry up the bread cubes. Remove cubes and saute the onions and garlic. Combine everything and pour into pie plate. Bake 350F for 30 minutes or until eggs are set as you like (we don’t like ours runny). Another Yarn Along this week. Congrats to Ginny and her family for the safe arrival of their little one! I wish the colour would show up better. When I have the sweater done, I’ll have to take Ella outside and see if it photographs better. It really is a beautiful marine blue -should be gorgeous with Ella’s blue eyes. As you can see, my big girl February Baby sweater is coming along well. 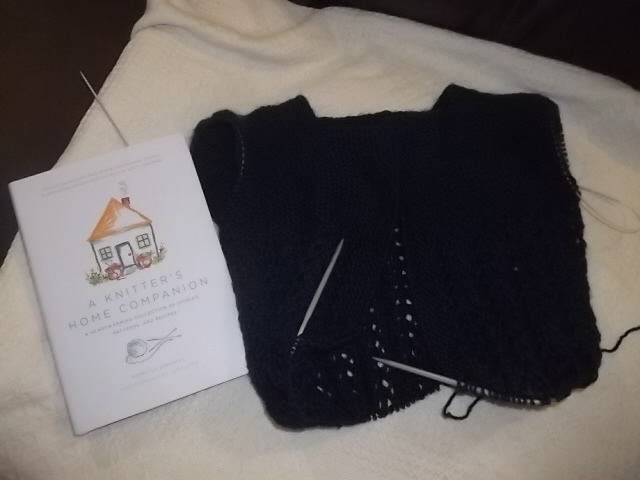 I just finished A Knitter’s Home Companion. It was ok. Not great, but certainly not the worst I’ve ever read. I haven’t decided if I’m keeping the book or whether I’ll put it into the library donation box. It does have one slipper pattern that I’m interested in trying. And here’s a recipe. I thought I had put this online before, but now I can’t find it. This recipe also works for freezer cooking. Just pour everything in a Ziploc baggie and toss in the freezer. Thaw, shake and pour into your pan when you want to bake. Mix together everything (custard) but cheese and filling. Arrange filling and cheese in a greased 9-10 inch pie plate. Set pie plate on oven rack and pour in custard. Bake 350F for 50-60 minutes. Let it stand for a couple of minutes before slicing. I love Julia Child. I received her Mastering the Art of French Cooking from my sweetie (I think he had ulterior motives). My favourite French Onion Soup is based on Julia’s, but I leave out the booze (of course) and use homemade chicken stock. Last week I made the Casserole-Roasted Pork. It was delicious!!! I’ll share the recipe with you here because it is more a method than an actual recipe. Julia suggests marinating the pork first but I didn’t get it thawed in time. Dry roast and brown on all sides. Put 2T of fat in casserole and cover and cook vegetables and herbs for 10 minutes. 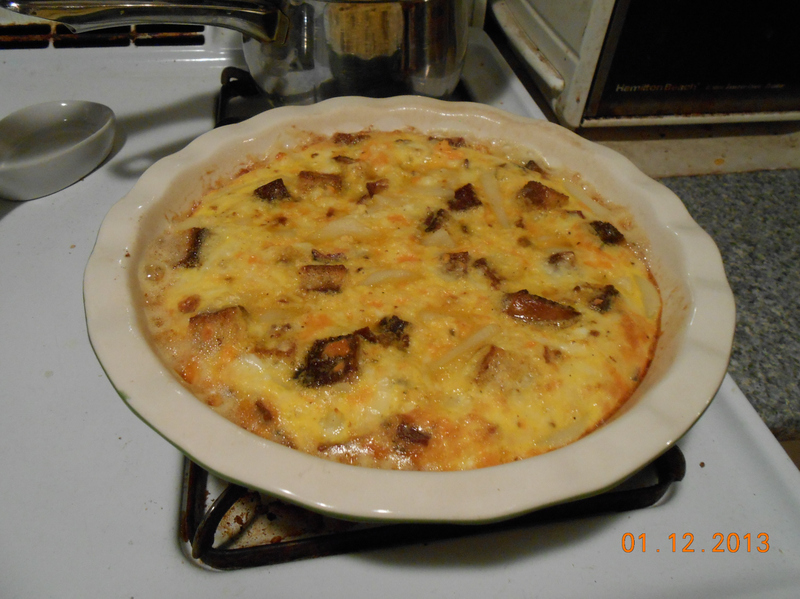 Put meat in casserole (fat side up). Season with s&p if not marinated. Cover and bake in 325F oven for about 2 hours, or until meat thermometer reads 170F. Baste meat a couple of times. Makes delicious gravy. This would be really yummy with roasted potatoes. 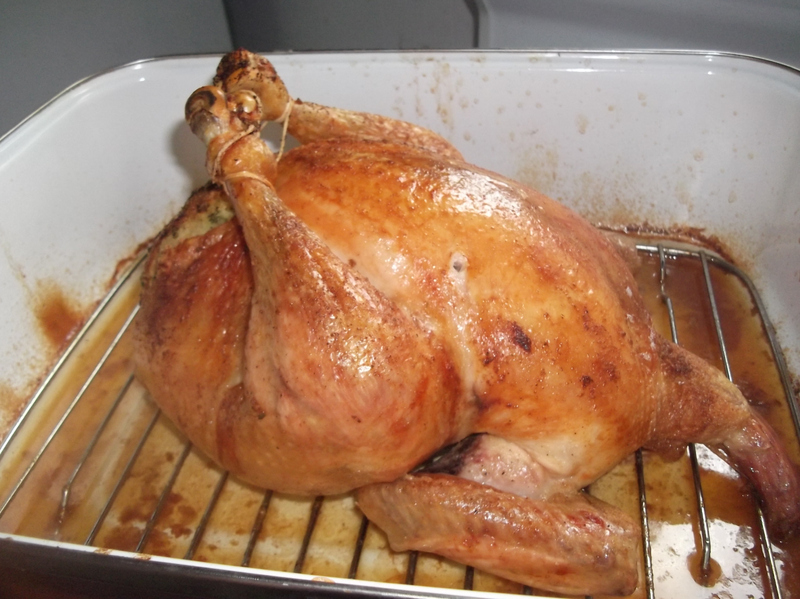 Place chicken on roasting pan, stuff, tie legs closed and rub with soft butter. Sprinkle with salt & pepper. Roast at 325F for about 30 min/pound or until 175F. Colin is always happy when I have enough leftover chicken to make chicken a la king. I’ll give you the from scratch version, but I often use leftover chicken instead. Cover with boiling water and simmer until tender. Dice chicken (needs 3 cups) and strain broth. In a large saucepan (I use non-stick), melt butter and cook relish until tender. Add 5 T corn starch and cook a little bit. Add 1 ½ c stock and cook until nice and thick. Add ¾ c milk or cream, 1 egg and the diced chicken. Cookie making happens on a fairly regular basis in our house. Most of my recipes make at least 5 dozen. Any less and there is no real point, they get eaten too quickly. Here’s Colin’s favourite chocolate chip recipe. This is one of my favourites too, it makes 11 dozen so they last for a while. Drop onto lined cookie sheets and bake 375F for 10 minutes. Do not over bake. We didn’t get a chance to make Poor Knights this week. We were pickling beets and didn’t have stove top room. I’ll share the recipe anyway, it’s yummy. Lightly beat egg whites with water. Beat the yolks and milk together. Dip bread into custard. Then carefully dip into egg whites. Coat with breadcrumbs on both sides. Fry slowly in butter. Sprinkle with cinnamon and sugar. A nice variation on French Toast. I’m sharing these recipes over at Full Plate Thursday, go see what else is on the Plate. We baked a double batch of bread yesterday. It was hot, but not as hot as the weatherman says is coming. 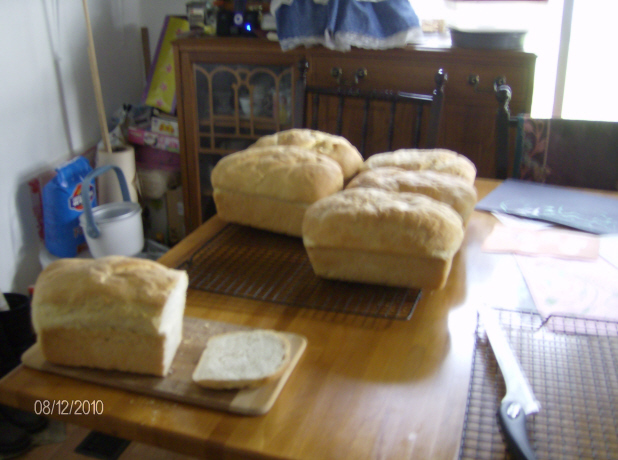 So I ‘made hay while the sun shines’ or in other words, baked bread before the hot and stupid weather returns. I don’t mind the heat, it makes the sweet corn sweet, but I can really do without the humidity. I used the ‘homestyle’ bread flour we picked up at the Tyrone mill when we were in Bowmanville. I usually use all-purpose flour. I can’t say I really noticed a difference in using the bread flour. I was well pleased that the bag of flour went as far as it did. Today for lunch I had a toasted tomato and bacon sandwich. It was as home made as possible. I made the bread (but not the flour), the bacon was Colin’s and it was the first tomato from the garden!!!! Colin’s not sure which one it was, but from the shape of it I’d say it was a Brandywine. Colin brought in 5 tomatoes but I forgot to get a ‘group picture’ before giving the extras to Colin’s Mom. Quiche -I use a largish tart pan with a removable bottom, it just makes things easier when the tart is done and you want to serve. Line your tart pan with pastry. I use pat-in pastry. Put in filling items of your choice. I usually add bacon, onion, roast potatoes and cheese. I like to put them in separately so I can space them evenly. Pour in custard (eggs and milk). I usually pour the custard in while the pan sits on the oven rack -no spills. Don’t fill tart all the way to the top or you’ll have a mess in the oven. Bake 375F for 35 minutes. Soak the bread in the milk. Add everything else and mix gently. Put into a greased loaf pan. Slice a thin piece off the top of each bun and scoop out most of the crumbs -leaving about a 1/2 inch shell. Put the buns on a baking sheet. 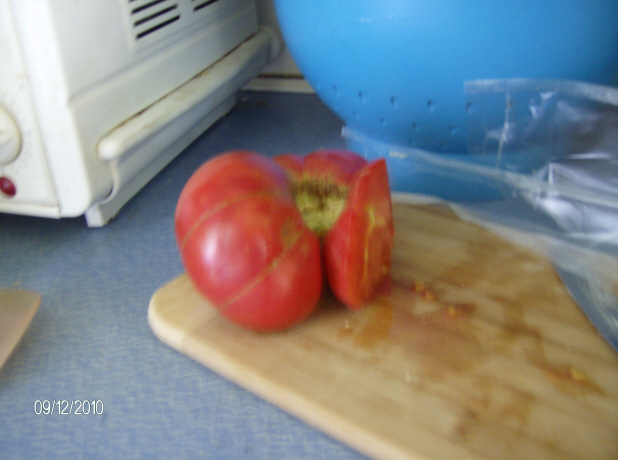 Put a slice of tomato in each. Carefully crack an egg in each bun. Sprinkle with s&p, then cream, cheese and scallions. Mix egg with salt & pepper. Dip pork chops to coat. Put chops in crumbs and coat well. Let sit for a few minutes to dry. Brown chops in oil in fry pan. Remove chops to oven proof casserole and add milk to almost cover. Turn once or twice as it cooks.